October 31, the Minister of Foreign Affairs of Ukraine Pavlo Klimkin told about the initiatives of the Foreign Ministry. “Today Ukraine will submit the draft of the updated resolution "Situation in the field of human rights in the Autonomous Republic of Crimea and Sevastopol (Ukraine) for consideration to the 3rd Committee of the UN General Assembly," Klimkin said. This is an essential step, since none of the provisions of UN GA Resolution 71/205 "The situation with human rights in the Autonomous Republic of Crimea and Sevastopol (Ukraine)", adopted on December 19, 2016, was fulfilled by Russia. This fact, among other things, is confirmed by the recent report of the Office of the United Nations High Commissioner for Human Rights. That is why, Ukraine is promoting a tougher document that would not only strengthen the position of the Resolution of 2016, but also contain new important points. First of all, ensuring international support for Ukraine in the matter of the de-occupation of the Crimea. A separate emphasis will be give to the need for Russia to implement the decision of the International Court of Justice in the case of Ukraine against the Russian Federation and granting access to the peninsula for international monitoring missions. The draft resolution also condemns the unlawful use of the legal system of the Russian Federation by the aggressor in the temporarily occupied territory of Ukraine, the expropriation of Ukrainian property, the automatic imposing of Russian citizenship to residents in the Crimea, the illegal summoning of Crimeans to the ranks of the RF Armed Forces, which is expressly prohibited by international humanitarian law. In this regard, the minister announced the launch of the information campaign #CrimeaIsBleeding, which focuses on the fate of the Crimea residents, who resist the repression and other challenges of the Russian occupation regime with dignity. "Their personal stories, stories of courage and dignity are our response to those who call on Ukraine to forget the Crimea or sell it," Pavlo Klimkin said. 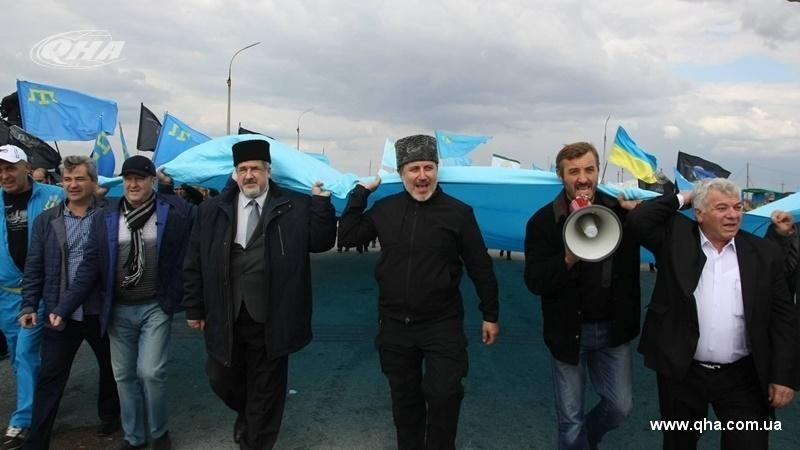 The first story was told by Akhtem Chiygoz, Deputy Chairman of the Mejlis of the Crimean Tatar people, who was illegally kept by the Russian invaders in prison for almost 3 years. New stories about the crimes of Russian invaders and the invincibility of Ukrainians in the Crimea will appear in the campaign weekly and spread by Ukrainian diplomats on all possible international platforms. According o the minister, the campaign should become a joint project. He called for Ukrainian and international media, civil society, students and the Ukrainian diaspora abroad to join it. Earlier, former political prisoners of the Kremlin, Deputy Chairmen of the Mejlis of the Crimean Tatar people Ilmi Umerov and Akhtem Chiygoz addressed the Verkhovna Rada of Ukraine within the framework of the Parliamentary Assembly Euronest, where Umerov called on the deputies not to forget about the Crimea.